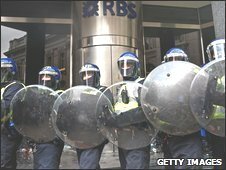 A protester was punched in the face by a police officer during London's G20 protests, he has told MPs. 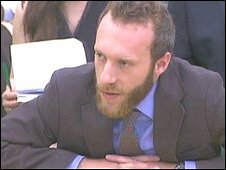 Chris Abbott, 30, from Reading, told the Home Affairs Select Committee he was sitting peacefully in Bishopsgate when he was "charged" without warning. Mr Abbott said the Independent Police Complaints Commission is investigating. However, senior Met Police officer, Chris Allison later told the committee the force's management of the protests "passed off successfully." Mr Abbott told MPs he had been laughing and joking with officers at the Climate Camp protest minutes before he was "beaten up". "If I am sitting on the floor talking to my girlfriend in a peaceful protest and had been knocked back onto my back with my arms clearly in the air - under what circumstances is it justified to punch me in the face?" he asked. "Having dragged me up and pushed me back onto the camp - what circumstances are there for smashing me in the side of the head with a shield as a weapon? David Howarth, the Liberal Democrat justice spokesman, told MPs police might have acted unlawfully by driving climate camp protesters off the road. He said police "ramped up" fears of violence in the weeks leading up to the G20 protests. "The police have to look very carefully at their PR strategy in the run up to major demonstrations and ask themselves whether raising the temperature makes the situation more difficult to control," Mr Howarth added. Mr Abbott added: "You do not expect to be beaten up by the police when you are exercising your right to protest on something as important as climate change." Later, the Metropolitan Police's Acting Assistant Commissioner Chris Allison defended the handling of the G20 protests. Giving evidence to the parliamentary Joint Committee on Human Rights, which is carrying out a separate inquiry into the policing of protests, Mr Allison said: "Taking the event as a whole, our view is the event at Excel passed off successfully. "We managed major protests without major disorder and damage to property. "We accept totally that there are some individual acts that need to be looked at. The Metropolitan Police does not condone excessive force." He also rejected allegations that police had deliberately hyped up concern over the potential for violence, insisting that press reports in the run-up to the protests had quoted Met spokesmen out of context.